2 Bedroom Detached House For Sale in Tunbridge Wells for Offers in the region of £599,950. 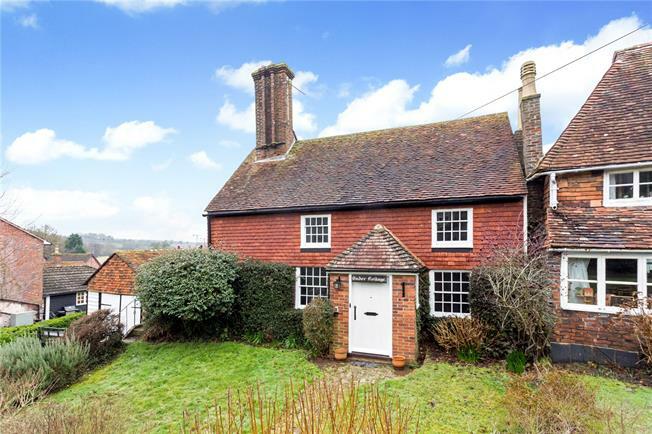 This is a delightful detached period cottage situated in a prominent position in this picturesque village within close proximity of the local amenities. Throughout the cottage there are numerous exposed oak beams and timbers, further points of note include: the excellent sitting room, a very good size and has a recess with fitted shelves, a fine inglenook fireplace with curved brick surround and oil fired stove to provide heating for the interior. The dining room has a sash window to the front and an attractive fireplace. The kitchen/breakfast room is newly fitted with a range of cupboards and worktops, a breakfast bar and an excellent range of fitted appliances. The adjoining garden room has doors opening onto the garden. To the first floor there are two bedrooms, the principal bedroom having a feature fireplace, sash window to the front and eaves storage. On the ground floor there is a family bathroom. The cottage has been well maintained with a new roof and tile hanging in the last 4 years but there is still scope for further improvements. Situated close to the centre of this popular village within easy walking distance of the general store with post office, hairdresser, pub and restaurant. The area is renowned for its educational facilities including grammar schools in both Tunbridge Wells and Tonbridge, independent and private schools and in the village there is a primary school. Lamberhurst is within an Area of Outstanding Natural Beauty and the Scotney Castle Estate (owned by the National Trust) with its parkland and woodland is just under a mile away and a little further is Bewl Water, an 800 acre estate with an extensive range of leisure and recreational pursuits including fishing, cycling, walking and sailing. The cottage is approached via a central pathway with a small area of lawn either side. A driveway for parking leads to the garage/workshop. The west facing rear garden is lawn with shrubs, trees, a small pond and a shed. Tonbridge mainline station for fast trains every 10 minutes to Charing Cross, Cannon Street and London Bridge in about 45 minutes. Alternatively Paddock Wood or Frant Stations (in Bells Yew Green) in about 54 minutes and 60 minutes respectively. Road Communications: The A21 is within close proximity for a direct route to the M25 national motorway networks. London Gatwick airport is about 40 miles and central London about 52 miles.